A few folks online kindly pointed out that I overlooked the fact that two missiles were launched, which does significantly affect my analysis and judgment relating to photomanipulation. Edits have been added in italics, the original text has been left in. This is part of an ongoing attempt to clearly identify, collect, tabulate, and track missile and rocket launches in the DPRK. This is basically a continuation of a list built for personal research and reference purposes, which will be periodically reformatted for internet consumption and posted here. The projectiles we will be tracking will be the most obvious ones, the guided missiles, and the unguided Luna/FROG and various MRLS launches when they are covered. Artillery shells will not be covered. We will start things off with the most recent Hwasong-6 launches. For those looking for the other recent launches, John Grisafi over at NK News has an article up with some interesting new information. For now, we are simply covering the Hwasongs. 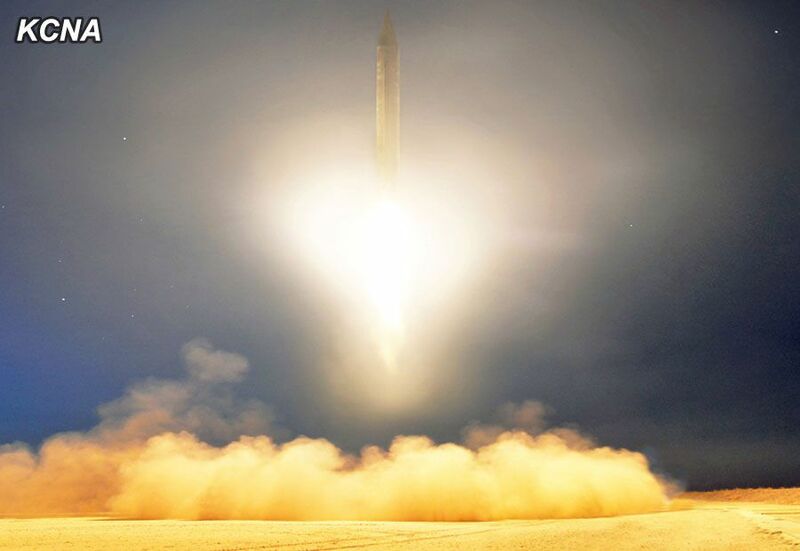 The June 29th launch was from the “vicinity of Wonsan” according to Yonhap, which likely means Kittaeryong (Gitdaeryeong, 깃대령, 안변군, 강원도) Anbyeon, Gangwon-do, where short-range ballistic missile tests have frequently occurred in the past. Most outlets are reporting it as an SRBM, specifically a Scud, which would be consistent with Gitdaeryeong’s previous launches. 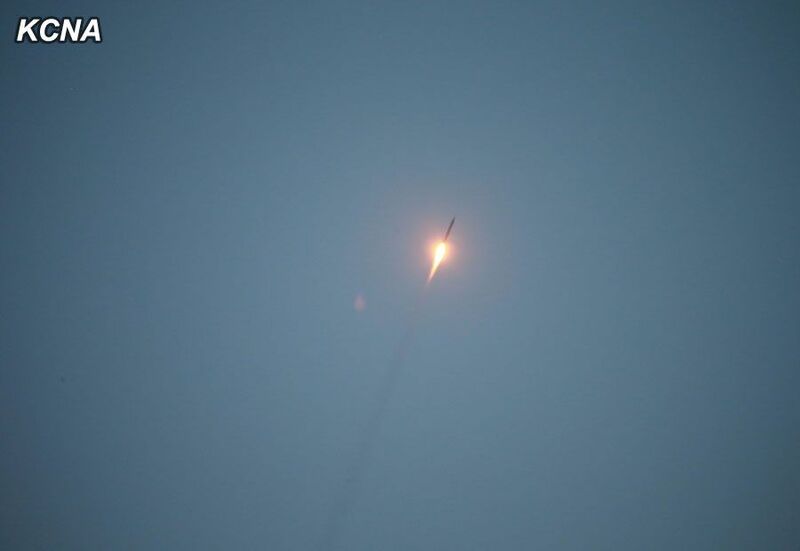 Imagery posted by KCNA (and accessed via KCNAwatch on NK News) appears to be consistent with a Scud, though the launch vehicle is not visible in any imagery. The ROK Joint Chiefs of Staff reported that the range was about 500km, which, out of the DPRK’s SRBM inventory, only fits the Hwasong-6 (Scud-C). 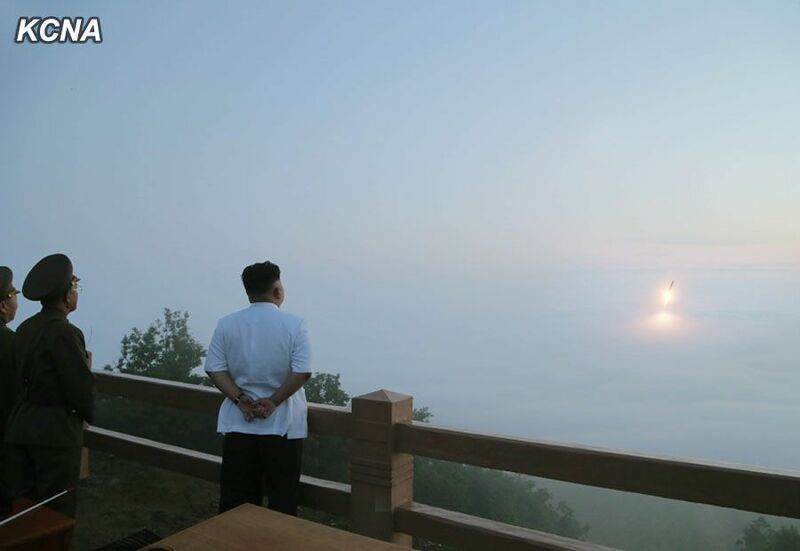 Two images of Kim Jong Un looking over the ‘launch area’ may reveal a photoshop job. 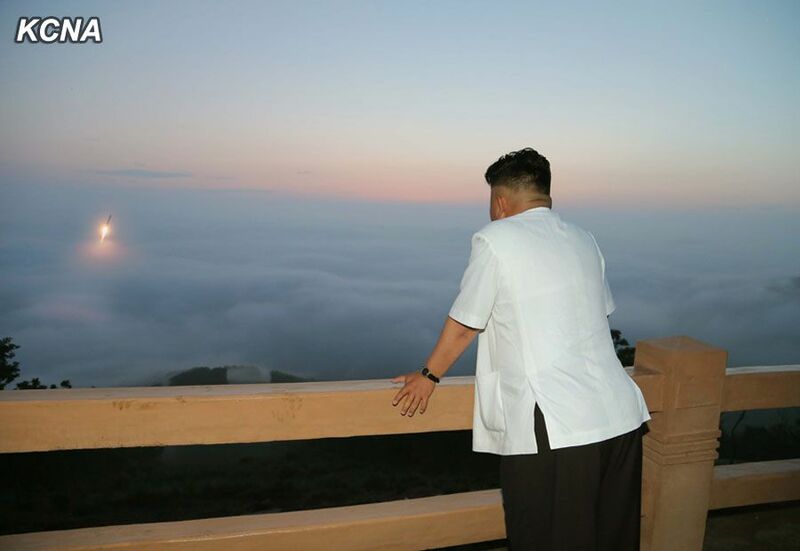 While we do not have training or experience in error level analysis, which may yield a clearer answer, it is rather impressive that he moved a few feet from a comfortable standing position into another comfortable standing position while the missile apparently slowly arced through the sky. Ballistic missiles move fairly quickly, and it would require a bit of footwork to move between two positions and have the launched missile appear in almost the same position. But this may be because there wasn’t a missile in one or both of these images. 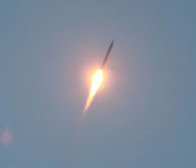 The missile as seen from the overlook appears to be at almost the exact same angle and position in its arc as this shot, presumably taken several seconds into the flight from below. Here are the two shots Kim Jong Un is supposed to be looking at, enlarged, with a zoomed-in version of the above shot, as well. A side by side comparison looks even more similar. The first in this series is the overhead shot, with the following two being the Kim Jong Un shots. Obviously the overhead is significantly better resolution. If these are in fact edited, then the lower resolution helps to not only fit it better into the image, but to obscure artifacts and obvious tells that it is the same image. In addition, I attempted to lower the resolution of the overhead shot to fit the other two better. Again, the first image in this series is the overhead, the second two are from the Kim Jong Un shots. We aren’t known for our photomanipulation skills, but it doesn’t seem like it would be that hard for someone with practice and dedication to put that overhead shot into the Kim Jong Un shots and alter the color so that it doesn’t stick out so obviously. We will give credit where credit is due, however. If these are manipulations, the glow of the burn on the clouds looks fairly good. As well, Korea is known for its coastal mist and fog, but notice how thick the fog is in the Kim Jong Un shots vs. the on the ground missile body shot. This does not necessarily mean that either of these shots is heavily modified (save for the images of the missiles launching above the clouds). However it does seem to note a disconnect between the events, in that either there was significant image modification, or that some of these photos are from different events on different dates and under different conditions. Since two missiles were tested that day, it would be reasonable to assume that the two images of Kim Jong Un watching are from each of the launches. 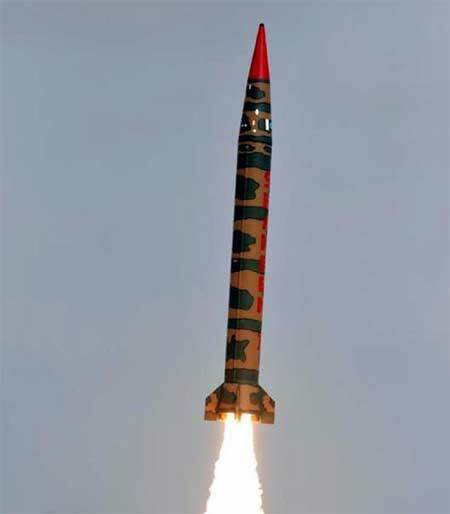 However, as we mentioned, the actual missile images are strikingly similar, to the point of raising our suspicions. As well, neither quite match the conditions of the close-up imagery, raising additional issues. This could mean that the close-up image is a stock image, though we have thus been unable to locate any previous use of the image, thus explaining the mismatched weather patterns. As well, if anybody has friends in Wonsan, they could ask what the weather conditions were like, since the fog was quite thick from above. As well, an oddity I haven’t been able to explain is one of the alleged in-flight images of the Hwasong-6, enlarged below. Even though it is obviously moving very fast and at an angle, there appears to be something odd about the nosecone. John Grisafi from NK News and I had a long personal exchange on these images, because everything looks like a Hwasong-6 except for the nose in this one image, which almost looks more like a Shahab-3/Rodong-1 length nose (the long conic version, at least, since there are multiple options), tacked onto a Hwasong length body, or just a Shaheen-2 labelled as a DPRK test. There are no absolute markers of length in this image, but the nose:body ratio is significantly off for a Hwasong, as can be seen in the launch pictures. As well, the other flight picture seems to have a normal Hwasong nose:body ratio, though it is quite fuzzy and hard to make out. Below is the normal looking Hwasong followed again by the elongated-appearing image. We ultimately agreed it was likely a Hwasong-6, as the body, fins, burn color, and other images were consistent with a Hwasong-6 and that my misgivings about its nose were a result of something wonky with how the picture turned out, but I felt it would be worthwhile to post my confusion here as well. The DPRK and state news agencies in general are known to fudge data upon occasion, and it is certainly not unusual to see altered or photoshopped images show up, especially when dealing with high-value military or propaganda assets. Either way, this is something we’ll keep and eye on, and will continue updating until we have a detailed and easy-to-access timeline of missile and rocket launches. As well, we are still building our imagery database of Hwasong images, especially of launches, in the hopes of figuring out if these were manipulated or just coincidentally similar. 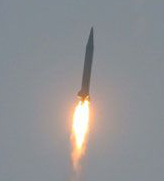 This entry was posted in Iron and tagged Ballistic Missile, Hwasong, Hwasong-6, Missile, Missile and Rocket Timeline, Missile Test, missiles, Rodong, Rodong-1, Scud, Scud-C, Shahab, Shahab-3, Shaheen, Shaheen-2. Bookmark the permalink. Solid work. One additional complication: The DPRK launched two Scud missiles that day. So, the two photos may be shots of separate launches. As pointed out by others, quite aside from the fact that there were two launches at separate times that morning, these really don’t look like photoshopped images – well, manipulated images anyway. The North Koreans do use an old version of Adobe Photoshop 6 to post process some of their press images, EXIF data sometimes reveals. But it’s pretty clear when they’ve edited something. They are not skilled image manipulators, and often use very rudimentary clone stamp techniques to mask or hide things they want to disguise – they did this very thing at the start of the summer where an aerial shot of the Children’s Camp in Wonsan had Kim’s summer palace clone-stamped badly out of the picture and replaced with sea. Then there are the famous hovercraft clone-stamp shots etc. Whilst it would be possible to photoshop those launches, I think this seriously over-estimates their photoshop skills. I used to work as a graphic designer – you learn to spot these things. You’re talking about sophisticated lighting techniques, some creative use of smoke effects, lens flares etc, in short something we just don’t see from the KCNA (or when we do, we see it done badly). At a lot of these military events that Kim attends they have several photographers shooting from different angles, etc, which may also go some way to explaining the lack of consistency in the images. The same day, the Rodong published close up shots of the launch leaving its TEL that we hadn’t seen before either. They did the same thing last week. Of course it’s always good to be skeptical and this article is a fine example of just that. It’s also not always immediately clear when looking at the photos in the PDF on the Rodong website – the bad compression hides crucial details. However looking at the high-res images released via their pics wire, I would honestly lean towards the side that suggests these images, although careful choreographed, were not photoshopped.